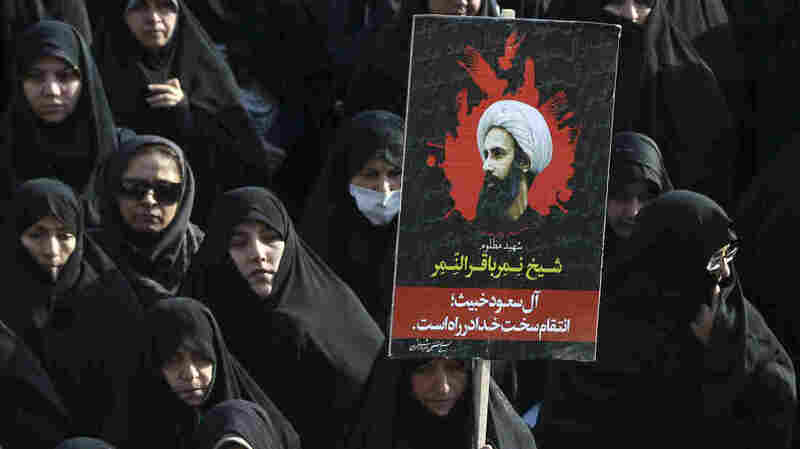 Journalist Says Iran-Saudi Showdown Comes At A 'Really Dangerous' Time Robin Wright, who writes about Saudi Arabia and Iran in the current issue of The New Yorker, says upcoming Syrian peace talks have been compromised by the execution of an outspoken Shiite cleric. An Iranian woman in Tehran holds up a poster showing Sheikh Nimr al-Nimr, a prominent opposition Saudi Shiite cleric who was executed in Saudi Arabia on Jan. 2. On Jan. 2 Saudi Arabia executed Sheikh Nimr al-Nimr, an outspoken Shiite cleric who had called for more rights for Saudi Arabia's marginalized Shiite minority. In response, an Iranian mob attacked the Saudi Embassy in Iran. Saudi Arabia then broke off relations with Iran, and other countries in the region have been choosing sides between these two powerful rivals. Most nations in the region are led by Sunni Muslims, and a number have sided with Saudi Arabia. Journalist Robin Wright, who has written about the Middle East since 1973, tells Fresh Air's Terry Gross that the conflict between the countries comes at an especially sensitive time. "The timing of this confrontation is really dangerous, because January was the month of important developments on four different peace initiatives that were really part of the international effort to prevent the Middle East from disintegrating completely," Wright says. In particular, Wright says that upcoming Syrian peace talks have now been compromised: "One of the great achievements by the United States was getting a 17-nation coalition together to talk about peace that included for the first time both foreign ministers from Iran and from Saudi Arabia, and now, of course, they've broken off relations." Wright is a contributing writer for The New Yorker and a joint fellow at the U.S. Institute of Peace and the Woodrow Wilson International Center. She wrote about this showdown between Saudi Arabia and Iran in the current issue of The New Yorker. Sheikh Nimr was a critic, but he had not been involved physically in violence. He had sympathized with the people. He had used pretty tough language when it came to criticizing the monarchy; he called it authoritarian and reactionary. ... He became controversial in 2012 in the aftermath of a new round of protests in the kingdom that were spawned in large part by the Arab Spring, as protests began to spread across the entire Arab world, and he was arrested at that time. He was charged with a number of offenses, including the absence of loyalty to the ruler, fomenting dissent and inciting public violence. There's a whole new cast of political players inside Saudi Arabia, and the king did something quite startling in terms of the slow-moving Saudi politics: He fired the crown prince. He named a nephew as the crown prince and his own 30-year-old son as both deputy crown prince and minister of defense — a person who had very limited government experience, was a largely unknown commodity inside the kingdom — and invested a huge amount of power, particularly, in his son. And many of the traditional players in the kingdom were pushed aside. What the king did, really, was carve out what amounts to a new royal family. ... And there are questions about his frailty on a lot of different levels, and there are questions about how much he's making a lot of the daily decisions. These elections are among the most important since the revolution, because they will determine the future of the revolution at a very interesting juncture. For [decades], hard-liners in Iran have controlled the basic levers of power. That began to change in 2013 with the election of a centrist president, Hassan Rouhani. Iran's election in February is for two things — first for Parliament, a second branch of government, as well as the Assembly of Experts. This is a group of people very much like the [Roman Catholic] College of Cardinals. There are 86 members; they are religious clerics and scholars, and they are the ones who will pick the next supreme leader. The supreme leader in Iran is 76. He had prostate surgery 18 months ago. He's comparatively sturdy, but the actuarial charts would indicate that this Assembly of Experts, which sits for eight years, may well pick the next supreme leader. ... If the centrists, reformers, moderates in Iran win more seats in Parliament, playing off the gains of the nuclear deal, then you would see two of the three branches of government in the hands of centrists, moderates, reformers. That would be a huge power shift. The young today don't talk about the ideal Islamic government. They're much more involved in new startups. I've been in Iran three times in the last 18 months, and I went to see the young twins who started up the equivalent of Amazon in Iran, and today it's worth $150 million, and they sell everything from Steinway pianos and perfume to refrigerators and dishwashers, computers. This is a huge operation. I went to see the 26-year old woman who started the Iranian equivalent of Groupon. And the young really have a different agenda. And that's why the revolutionaries, now in their 60s, 70s, even 80s, realize that something different is happening, and that the numbers are against them.